The Ramble at Biltmore Forest is a new, gated, luxury home community in Asheville NC that has been created around natural settings, parks and gentle flowing streets. 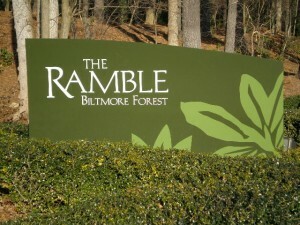 Biltmore Forest backs up to the Ramble and also offers fine luxury homes, land and real estate here in Asheville. You will enjoy country mountain home living at The Ramble with all that the Asheville area has to offer just minutes away. Call Green Mountain Realty at (828)-215-9064 or contact us for a tour of this fine, luxury home, gated real estate community here in Asheville.